Designed to improve fat metabolism and support proper liver function, this formula contains a synergistic blend of vitamins and herbs for maximum effectiveness. L-Carnitine, L-Methionine and Chromium work to help your body stimulate fat loss while Milk Thistle works to keep your liver cleansed and working its best.Kosher. Each bottle contains 60 tablets, which is a 20-serving supply at the recommended dosage. $17.99 per bottle. Wheat Free & Gluten Free. From Kristi B of Fort Lauderdale, Florida on 12/7/2014 . These are BIG "horse" pills, so you need lots of water to wash each one down. 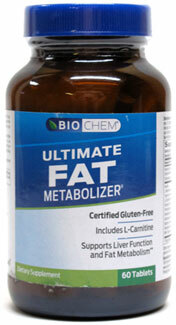 I take a green tea pill before breakfast and lunch and then take these 3 fat metabolizers before dinner. I have dropped 3 lbs after taking them for 5 days. I plan to continue with this regimen to hopefully obtain my desired results. From zoey vanguard of melbourne, victoria, Australia on 7/1/2011 . From Anonymous of Fredonia, New York on 3/9/2009 . I've been taking this for a month and haven't seen any results. Save your money for a gym membership instead. From Anonymous of Los Angeles, California on 3/7/2008 . Vegetarian stearic acid is either derived by hydrogenation saturated vegetable oils, or is found naturally in cocoa and shea butter. Stearic acid is a fully hydrogenated (saturated) structure; it therefore has no trans fats. Trans fats describe an unsaturated fat in the trans conformation, but isn't applicable to saturated fats such as stearic acid or stearates. From Ajax of OKC, Oklahoma on 6/20/2007 . Not many people realize this yet, because the supplement industry doesn't want it known -- the excipients Magnesium Stearate and Stearic Acid are HYDROGENATED, TRANS FATS. And it's nearly impossible to find a supplement that does NOT contain them. So even if they're only present in tiny amounts, it really adds up quickly! These are TOXIC substances which decrease absorption of the nutrients and may be immunosuppressive. Now that health-conscious people are avoiding trans fats, it's an outrage that we're ingesting them without our knowledge, thanks to the dishonest supplement manufacturers.